Why you need a VPN and how to choose one | Whatever IT Takes. Real People, Real Service. Back in the day, simple antivirus software was all you needed to stay safe from security threats. Nowadays, it takes more than that to protect your online privacy. Whether you’re sending emails or chatting up a friend online, chances are your Wi-Fi connection can be intercepted. This is why you need a virtual private network (VPN). Here’s how to choose one wisely. 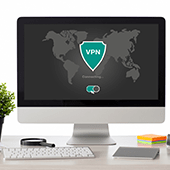 VPNs are now a vital component of cybersecurity, and if you need help selecting the right one for your business, consult with our security experts today. Lanlogic also offers comprehensive cybersecurity services so no hacker or third party can get their hands on your data.